When CDs struck a death blow to all other audio formats in the 1980s, no one stopped to mourn the lowly cassette tape. It was vinyl, with all its nostalgic charm, that captured the hearts of sentimental music lovers, and product designers leapt on it, turning discarded albums and their big, comforting picture sleeves into bracelets, bowls, and notebook covers. But finally, the long-ignored cassette tape is making a stylistic comeback as the generation who grew up with the flawed format gives it a second look. At Grand, the hip, new-ish, Union Square shop, the store's CEO, Jonathan O'Toole, waited two months to get his hands on a USB stick that is designed to look like a beloved old mix tape. The British company that makes them was besieged with orders for the item (he finally has them in stock). The USB Mix Tape is a 64 MB USB drive that holds about an hour of music, cleverly concealed in packaging that looks identical to the beloved mix tapes of yore. "There is nostalgia for everything from the 1980s, and cassettes are definitely a part of that," O'Toole says. "Look at all the bands that are popular now, they're all influenced by the '80s. It's the same for fashion. The cassette was bound to reappear eventually." O'Toole, 33, was actively following music when cassettes were still a viable form of sharing songs. Not so for 24-year-old Alyssa Thralls, who sells her mix tape necklaces on the hipster-crafting website Etsy. 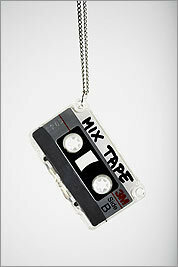 Search "mix tape" on Etsy, and dozens of cassette tape-themed products pop up. Thralls has made a few mix tapes in her life, but she confesses that she was too young to have ever seriously dabbled in creating them for early crushes. It represents nostalgia for a past she wasn't quite a part of. It's the same for artist Sarah Cihat, who rescues thrift-store plates and refinishes them with contemporary motifs. One of her more recent designs is a cassette tape silhouette. "It brings up memories of childhood," she says. "And it also has a nice, recognizable profile that people respond to." Then there are the fans of cassette style who were even too young to listen to Raffi on cassette as toddlers. "My parents always bought CDs," says 17-year-old Ginny Twomey, who was wearing a cassette T-shirt recently on Newbury Street. "So I never really used cassettes. I heard they didn't sound all that good, but at least they looked cool." 1. Cassette tape dispenser Gimmicky, but fun, j-me Design's cassette tape dispenser holds the sticky kind of tape instead of the musical variety, $20 at perpetualkid.com. 2. Mix tape necklace Finally, a good use for irksome microcassettes. Thralls attaches tiny cassettes to silver chains to transform them into wearable audio. $10 at mocktherock .etsy.com. 3. Cassette tape rain T-shirt The tiny, Toronto-based T-shirt company No Demographic makes a pair of T's that pay tribute to the cassette, including this shower of tapes. $18 at no-demo.com. 4. Cassette dinner plate Artist Sarah Cihat rescues unwanted plates from thrift stores and gives them new life by resurfacing them in fresh colors and designs. The large cassette dinner plate is $59 at sarahcihat.com. Her dinnerware can also be found at Louis Boston, 234 Berkeley St., 617-262-6100, louisboston.com. 5. jDuct cassette tape wallet Retro-themed wallets made of out of duct tape include this aquamarine salute to the cassette tape. $20 at jduct.com. 6. Cassette tote Fred & Friends' clever cassette bag leaves no question as to your preferred audio format. $12 at Joie de Vivre, 1792 Mass. Ave., Cambridge, 617-864-8188, joiedevivre.net. 7. Cassette tape belt buckle Portland artist Chandra Sweet turns long-forgotten cassettes from Abba, Debbie Gibson, and Culture Club into belt buckles. She also recycles the covers into luggage tags. Imagine the envy from the other passengers on your flight as you pick up your suitcase with the Andy Gibb tag. Belt buckles, $15, luggage tags, $6 at honorable-mention.com. 8. USB cassette deck Before converting your cassettes into belt buckles and wallets, Ion's USB cassette deck allows you to convert your cassette's music to digital files on the computer, $140 at thinkgeek.com. Neon Coming soon to your fall/winter wardrobe: Black with serious splashes of neon. The skinny tie Once a width only Duran Duran could love, skinny is the new standard for neckwear. Members Only jacket, version 2.0 Members Only has relaunched its iconic jackets in metallics and leathers. Shoulder pads They made a dramatic reappearance on New York runways last year, and unlike leggings, they appear to be sticking around (sorry, Lindsay Lohan). The tailored dress It's not quite the "Working Girl" power suit. But designers are pinning their hopes on tailored dresses returning to the workplace this fall.